This is a review of Will’s General Hair Growth Vitamins. It is a dietary supplement that was scientifically created to nourish your hair that is thinning. It also states that is also helps to grow more hair. Read on to learn more about this all natural supplement. The recommended daily dosage is for 3 pills per day. The product should be used for a minimum of at least 3 months to see any positive changes in your hair. The vitamin supplements have no side effects and are completely safe. It is still recommended to talk to your physician before taking this supplement if you are taking any other medications. Of course, if you are pregnant or nursing, it is advisable to speak to your physician as well. The vitamin supplement originally sold for $67.99. Currently they are selling a month’s supply for $16.99. They are currently out of stock. Amazon sells the formula for a promotional price of $15.99. The formula comes in a bottle of 90 which is enough for one month. If you subscribe to their email list, they will provide you with a coupon for a free bottle of the vitamin supplement. There are not guarantees provided for this supplement if you are not satisfied with the results. They have a pretty strict return policy but it is possible if the product is still in a sealed package. They do charge a 10% restocking fee unless there is a manufacturer’s defect. There are numerous reviews on amazon.com for this product and most of them are positive. The average of all of the reviews gave the product 4.3 out of 5 which is excellent. Many reported their hair did show improvement after the product was used for a certain length of time and even the ones who may have not seen much improvement in hair were satisfied because the supplement provided many vitamins the body needs to function properly. 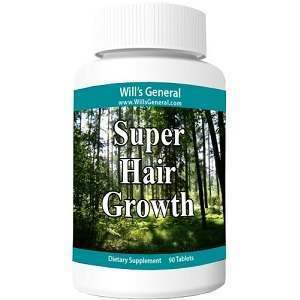 Will’s General Hair Growth Vitamins do provide many nutrients that are good for your body. Amazon.com does have numerous positive reviews for this product. The product does not have a satisfaction guarantee. They will allow for returns of unused portions but they charge a restocking fee on all returns. The price has been considerably reduced which would send up a red flag that this product just isn’t selling and it may not work as suggested. John Brownstone	reviewed Will’s General Hair Growth Vitamins	on November 24th	 and gave it a rating of 3.